Swift wrote: I hate the looks of the Optimus, especially the front with those slitty headlights. It looks so cheesy. That Leyland National like rear roof pod is uglier than the worst sin. I guess the Volvo engine actually sounds like an engine again instead of a dog whistle, but no better than a Scania. We may as well have full electric propulsion now. Personally I think the Optimus looks the way a modern bus should look and is at least a modest aesthetic masterpiece imho, but that all boils down to everybody's personal opinion of course. What interests me most is that Volgren has made an effort with internal ergonomics to make the design function optimally as a commuter bus, including most importantly for the comfort of its passengers - issues like step heights, seat pitch, seat layout, internal lighting, window-line for the benefit of passengers rather than bus engineers, etc. They're also just about the only local body-builder who can do a proper low-floor bus well. I can see why a lot of drivers are raving about these buses....the speed off the mark is just a breath of fresh air. Two improvements would be reinstating the back window to allow more light in and raising the seats on plinths so that passengers can have a better view. Ray wrote: Two improvements would be reinstating the back window to allow more light in and raising the seats on plinths so that passengers can have a better view. I presume you mean the seats on the low-floor? The Volgren window-line is perfectly aligned with all the seats to enable a clear view out the window, while retaining adequate bulkhead protection against being thrown out the window in a side impact. There isn't much scope for adjustment in this context. I think with rear-engined buses and the equipment that goes up to the roof in them we've kissed goodbye to the back window! Though some European models with the cooling tower just in one rear corner still manage to have a rear window. I was waiting for a 310 at Eastgardens this afternoon, which just managed to limp to the stop from the standing area. After some fiddling the operator climbed out, went to the the side, came back and it started. 'Someone turned off the gas' was the comment. Not quite a observation but something doesn't seem right about that pic. Also the right side of the bendy looks like a Bustech front for some reason, but seeing that it is the shorter section, it must be the back. Or are there any bendies with a shorter front half? ^ It's the back. Note the dual tyres. It's an engine fire in a LHD (i.e. overseas) bus. 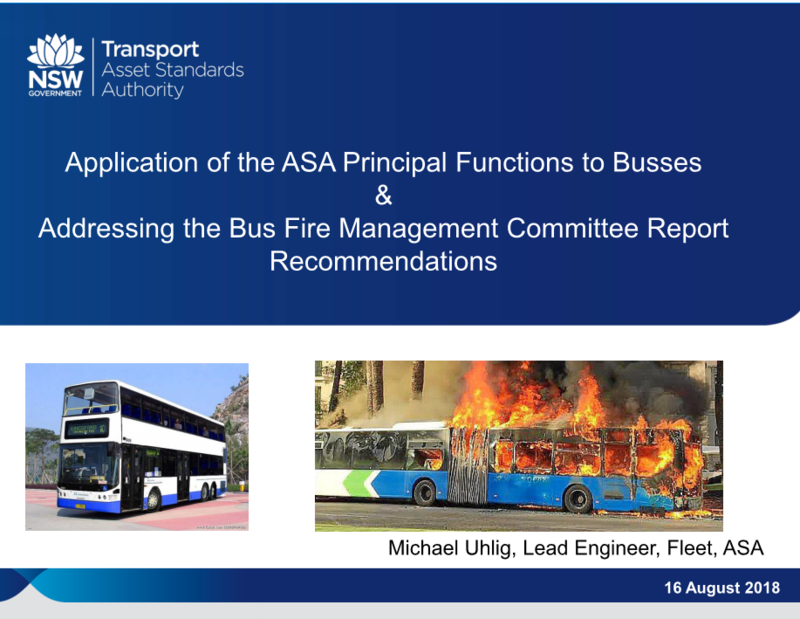 Perhaps it's meant to reflect TfNSW's current attitude towards double decks vs artics - after all it's not a spiffy looking artic vs a burning double decker! Thank you for recent feedback regarding advertising on bus windows. Advertising over windows is an accepted format of advertising on buses both throughout Australia and internationally. In Sydney, all advertising on bus windows is designed to be transparent, allowing a level of visibility out of the windows. We appreciate that in wet weather conditions, visibility can be reduced through windows featuring advertising. This is why high priority areas on the kerbside of the bus (e.g. windows near the front of the bus) are always clear of advertising. This permits customers full visibility through the front windows and towards the kerbside of the bus, so they can locate their stop or keep track of where they are on a particular route. Advertising film on bus windows has the added benefit of reducing the incidence of graffiti and minimising glare for customers on sunny days. I appreciate the explanation, but I still don't think its completely convincing. TSA has already applied adverts on their new Gemilangs, and its better done, so theres a bit on the foldup seats and then half a window pane of transverse seating is covered - thats a lot more fair. I also note TSA's ex-STA Western Sydney buses, the B12 CB60's (I saw one on route 422 the other day), theres only one ad sticker, whereas STA's (1500 series), the entire right side of the bus is pretty much completely covered. Shame. I saw bus 1169 parked in the compound with the S set at Petersham today. idontknow556 wrote: I saw bus 1169 parked in the compound with the S set at Petersham today. What have they done/ are doing with 3095? I think you mean 3195. Oh yes, the lower hp version of the 0405!! sunnyyan wrote: Also the right side of the bendy looks like a Bustech front for some reason, but seeing that it is the shorter section, it must be the back. Or are there any bendies with a shorter front half? There is a new livery for route 333. It has been applied to 2226.
so Port Botany appears to have changed its mind about CB80's, the last of which were all given to TSA, they've now received two of the latest Scania's, 2893, 2894. Since TSA took over R6, all of the Scania K310UB CB80 were lost to TSA, but STA appears to now be taking up some of the new ones again. Wonder if these will last for more than a few months at P before being moved somewhere else. How do you know its got anything to do with P? I am sure that P has no say in such things. Tonymercury wrote: How do you know its got anything to do with P? They are not true Ivecos. They are a badge engineered job as a result of take over of International Harvester in Victoria. They are an amalgam of boring soulless American sourced components with an Iveco label slapped on with a tube of Bostick liquid nails from the nearest Bunnings outlet. I note Transport Info is currently advertising express buses from Dee Why and Manly Vale B-Line stops into the city. I presume these are pre existing services that they have just decided to advertise unless I have missed something. Yeah for some strange reason this popped up today - they are just pre-existing services. I imagine B-Line has been a victim of its own success and that this is a ploy to spread the load a bit. I gather Opal data has highlighted that B-Line is packed yet the Exx services are relatively under-utilised. Swift wrote: They are not true Ivecos. They are a badge engineered job as a result of take over of International Harvester in Victoria. They are an amalgam of boring soulless American sourced components with an Iveco label slapped on with a tube of Bostick liquid nails from the nearest Bunnings outlet. Are Bunnings going to run weekend courses on this?